Project Transformation is an eight-week summer camp held in churches creating bonds between the interns and the children they serve. Challye Hays laughs with children as they play corn hole in the gym at Antioch United Methodist Church. Writer, Kelly Caviness, and a little girl, at Project Transformation's Family Fun Night. Photo by Kathleen Barry, United Methodist Communications. I had not been in Antioch United Methodist Church’s gym for two minutes before I felt someone hugging my legs, and looked down to see a young girl’s beaming face. I had never seen her before. Her immediate love towards a stranger struck me, and welcomed me into an atmosphere where children are being nurtured and encouraged to grow. I had just arrived at Project Transformation’s Family Fun Night, a celebration of the successful eight-week summer camp that had just taken place at five church sites around Nashville. PT is a national program with sites in Oklahoma City, Dallas and Nashville, Tenn. The program connects college-aged young adults with children and churches in underserved communities, with the objectives of providing children with an enriching experience that improves literacy skills and revitalizes the churches. The program is community-oriented and Christ-centered. The most intriguing aspect of Project Transformation is that the interns are changed as much as the children who participate. “I had no idea what I was getting into. I never considered working with children, but they have completely opened my heart. I did not expect the love that I would have for these kids. Now, my heart is breaking that I have to say goodbye to them so soon!” says first-year intern Sarah Fuquay, 19. Fuquay is a sophomore at Butler University, and learned about Project Transformation through her aunt, Sarah Wilke, who was founder of the program in Dallas, and is now world editor and publisher of the Upper Room Ministries in Nashville. In addition to molding the hearts of workers, there is no doubt that Project Transformation has improved the lives of children and their communities. 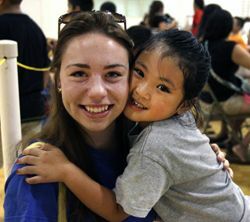 The 37 interns have served 380 children spread over the five Nashville sites. Courtney Aldrich, executive director of PT Tennessee, says that not only literacy skills, but also behavioral skills, improve throughout the program. Courtney Aldrich, founder of PT Tennessee, talks about the goals of connecting church and community. Project Transformation changes the churches, too. Aldrich says Antioch United Methodist Church was a “commuter church,” where members would travel up to an hour to attend services, but the church body was not at all representative of the surrounding people and the culture of the community. Members have welcomed PT participants with open arms and even started an after-school program for the children. PT’s Family Fun Night consisted of dinner, various games for the children, a touching slideshow, and finally, the tradition of throwing pies in the faces of interns. Tables of parents formed a community, too, while fondly watching their children laugh and play under the supervision of PT interns. It is amazing to see the significant difference that other people my age are making in the lives of children like the little girl I met. PT workers improve a child’s literacy skills, and they also give them a valuable Christian foundation that will guide them to a promising path as they grow older. However, the most important thing to do is love them, and the kids make that incredibly easy. PT originally began in Dallas, where a year-round program is held. In fact, PT Tennessee has made such a positive impact on Nashville’s surrounding communities that a sixth site and a year-round program will be added in 2015. Plans for a national expansion of the program got a boost from the Young Clergy Initiative, which awarded a $600,000 a grant to the program’s fundraising efforts for expansion. A dozen annual (regional) conferences in The United Methodist Church want to start Project Transformation sites. Since the project began in 1998, more than 60 percent of the students who have worked with Project Transformation have gone on to do some sort of ministry or service. More than half are employed by The United Methodist Church. The Young Clergy Initiative, a $7 million fund approved by the 2012 General Conference, aims to increase the number of young clergy in The United Methodist Church. As the night was coming to a close, I began asking questions about the details of interning myself at Project Transformation in future summers. I did not expect the children’s smiles and laughter to be so intoxicating! The atmosphere of God’s love surrounding Project Transformation was incredibly refreshing and prompted me to get more information. To become involved in Project Transformation, visit projecttransformation.org for internship applications and information. Applicants must be at least 19 years old, or have finished their freshman year of college. The applications are accepted on a rolling basis until all positions for the summer are filled. Caviness is an intern for United Methodist Communications. Contact her at (615) 742-5470 or newsdesk@umcom.org.